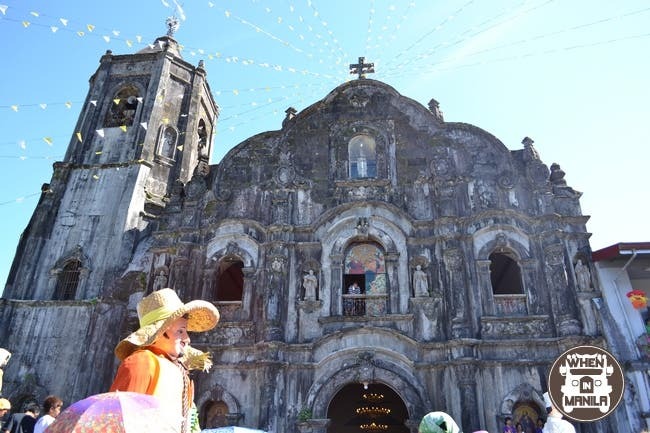 When in Manila, be sure to visit the town of Lucban in Quezon Province during the 15th day of May to join in the celebration of the Pahiyas Festival. 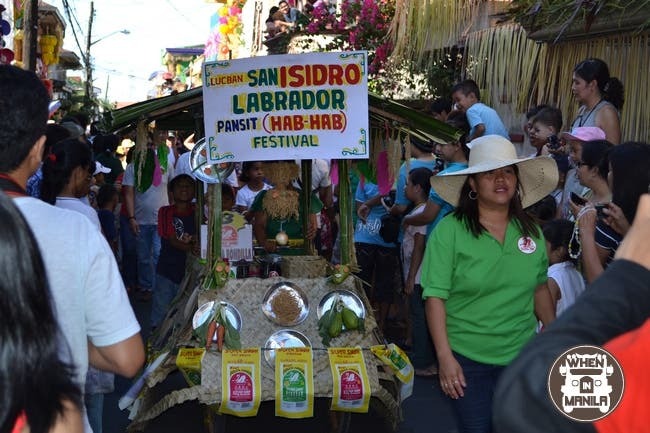 It’s a festival to honor the patron saint of the farmers, San Isidro Labrador, for giving them bountiful harvests throughout the year. 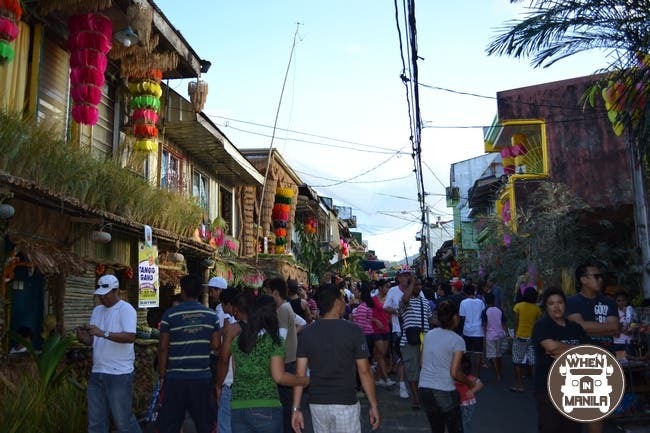 Pahiyas is also one of the most awaited and celebrated Harvest Festival in the Philippines which I, WhenInManila.com contributor Rikki De John de Castro, personally enjoyed and experienced together with my cousin, Kuya Dewie. I am from Pasay City and my cousin is from Paranaque City so we planned to meet up in Star Mall Alabang. 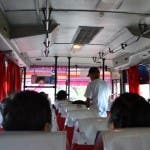 To go there, I rode a Jeepney in EDSA with a route to Alabang Express or Alabang Star Mall Metropolis. Then upon arriving and after waiting for him for an hour (damn Filipino time), we crossed the foot bridge that went in the terminal on the other side and rode a bus going to Lucena City – say that you’ll go down in Sta. Cruz. Upon arriving at Sta. Cruz, we rode their Big Jeepney / Mini-Bus bound for Lucban. It was a crazy ride and the road ahead was full of curves but the view was breath-taking. Alas! 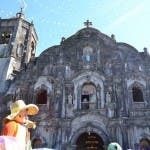 We arrived in town proper of Lucban. Four hours after I left Manila, we finally arrived at our destination and the very first thing we did was to find my cousin’s friend and then find a restaurant where we could eat. The streets were jam packed by people wandering around under the burning sun though it never seemed to bother them at all. The restaurants were full of people eating while there was a line of hungry people outside their doors waiting. We circled around for an hour and finally we found one. We ate in the Patio Rizal and their Cordon Blue with white sauce was delicious but the Sweet and Sour Fish Fillet was not. It’s a bit over price as well considering the serving was kinda small. Anyways, after filling up our empty stomachs, we rested for a while then began our adventure. 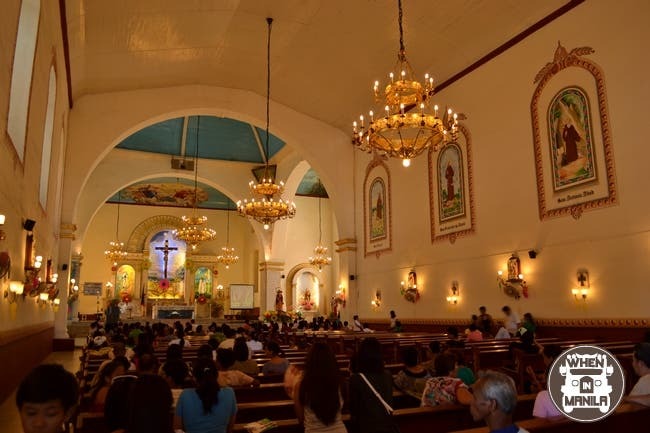 The Church of Lucban was just around the corner. We passed by in this iconic church, while looking for a restaurant (again), but this time I got the chance to admire it’s beauty. 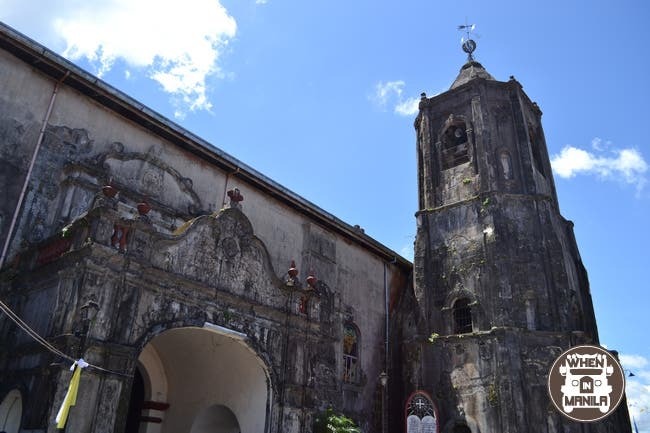 It was one of the oldest churches not only in Lucban but in the entire Philippines as well. Eventhough a lot of time had passed, the architectural design can still mesmerize every person who will see it. We also headed to the church to watch the beginning of the parade. 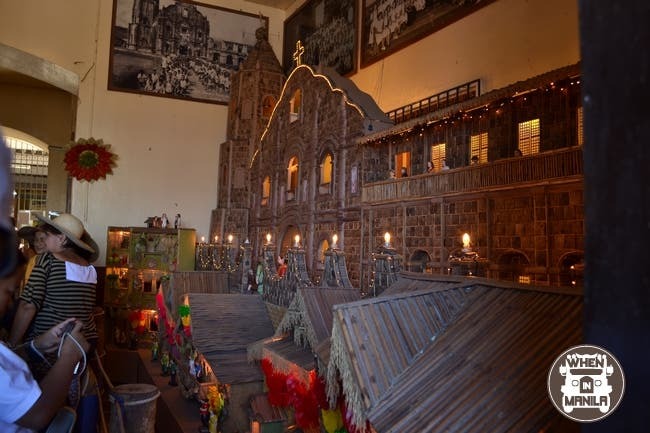 We then went to the the other side and saw a splendid miniature version of the church and some other colorful dioramas about Lucban. We took some photos and donated some money in return. We began to wander around again looking for the “Kiping” Houses, we asked some of the locals where we could find these Kiping Houses but they didn’t know neither as apparently, the location changes every year. We walked and walked until we “accidentally” saw one of the house on the other side of the street. We were amazed with what we saw and I was really happy because I’ve only see those houses on the internet before. Of course, I could feel that the people around me felt the same way. 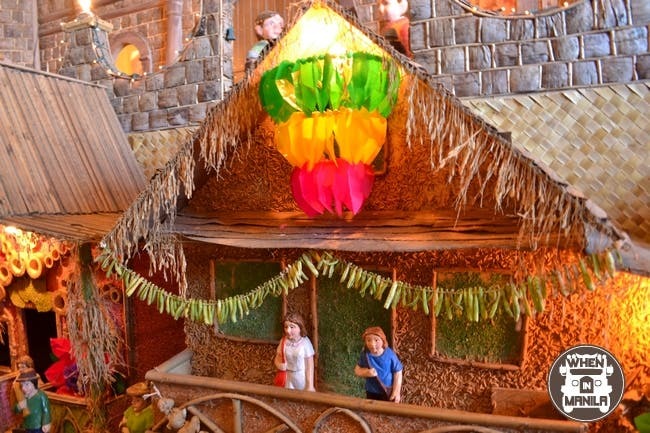 The Kiping Houses are named as such because they are covered with different colorful rice wafers or “kiping“, fresh vegetables from their harvest, some handicrafts and some other traditional materials. Every house has a different, unique design and you can really see the effort they put to make these Kiping Houses to make them attractive to the eyes of the visitors. We stopped at every Kiping House to take some photos. 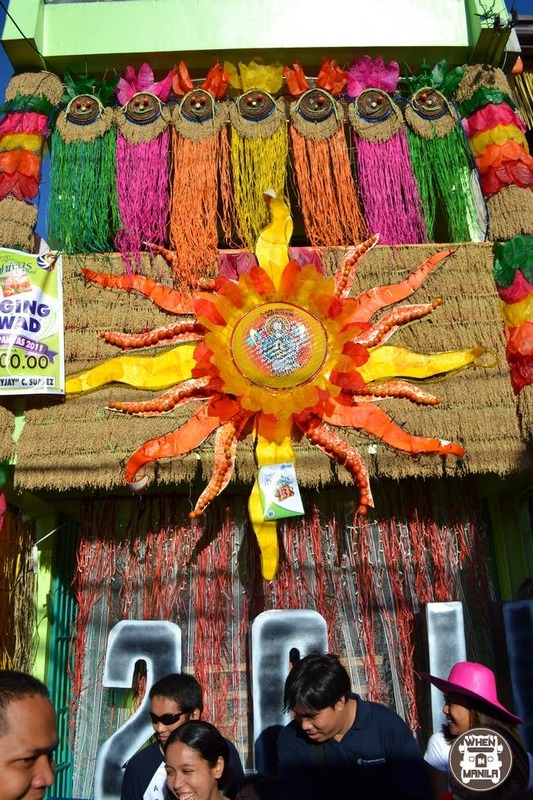 You can also check my blog post on Pahiyas Festival 2011: The Colorful “Kiping” Houses of Lucban for more photos. While having our intensely colorful photo session, we heard a siren signalizing the start of the parade. I prepared my camera coz there was no way I was letting this pass me without taking souvenir photos. 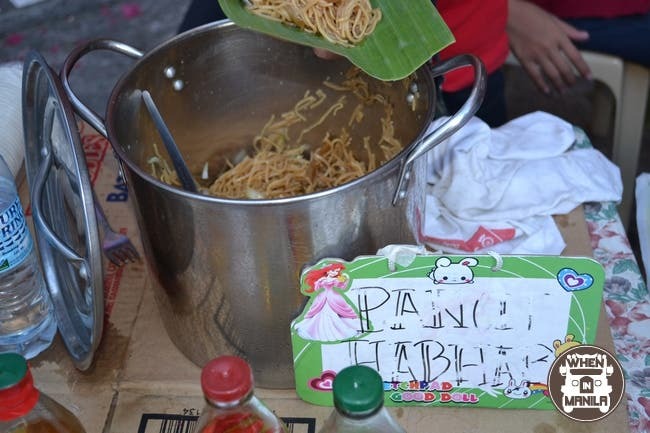 The first in line for the Pahiyas Festival were the carts of “Pansit Habhab” (local noodles) – the main food delicacy in Lucban. The carts were covered with some vegetables, handicrafts and some other colorful materials as well. I think they were giving away free sample of their homemade “Pansit Habhab.” It was soooo good that their pots were already empty when it reached us (insert very sad face here). 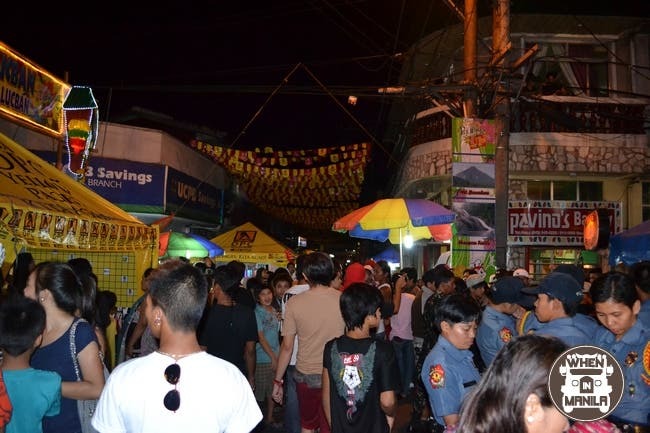 It was then followed by the large floats of the different partners and sponsors of the Pahiyas Festoval like LBC, Smart, San Miguel, Coca-Cola, Union and more. 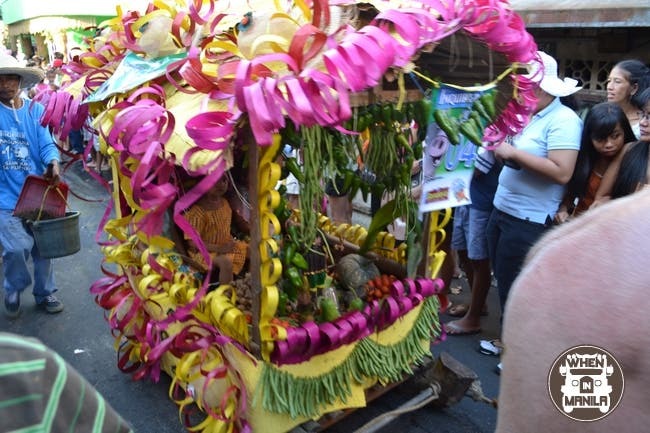 The floats were also designed with “kipings” and fresh vegetables. Be careful around these delicate floats. You don’t want to be like me as I accidentally knocked off some of the “kipings” on the wheel of one of the floats. Ooops. 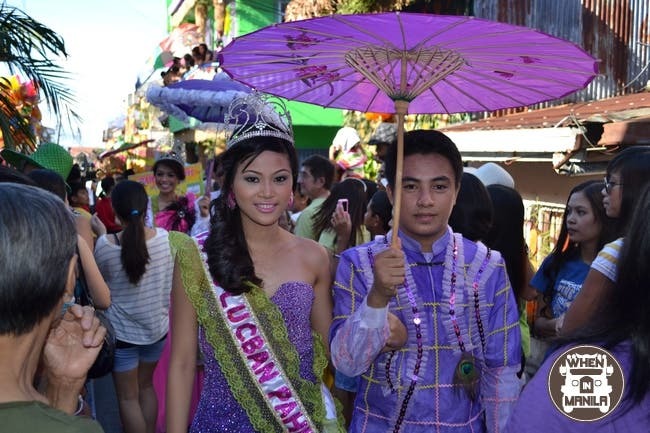 Pretty girls were everywhere but the gorgeous ladies of the “Mutya ng Lucban” stole the spotlight. These beautiful pageant contestants charmed the audience with their splendid gowns and lovely smiles. My courageous cousin then borrowed my camera and went in the middle to photographed them all. Another good thing about them was that they were not snobs, but actually very friendly. Here are some of the photos taken by my cousin. 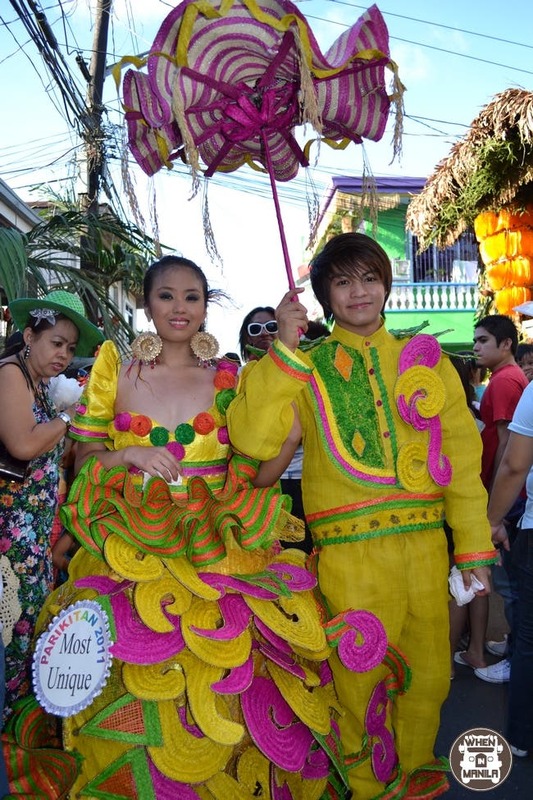 Parikitan challenges every dress designer in town to create a beautiful dress design that incorporates the spirit of the festival. The clothes were as vibrant as the houses they were passing by. You can see the creativity and talent of every designer that worked hard to make the clothes stand out from others. These Parikitan gowns were worn by another set of pretty ladies together with their escorts. 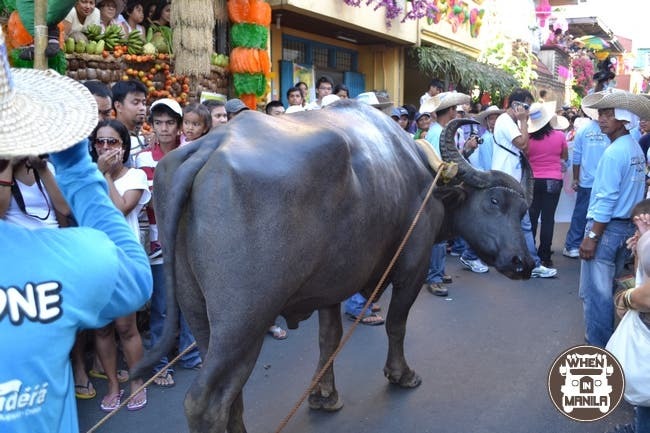 It was then followed by the carabaos, or the Philippine Water Buffalo, who had their moment to shine in the colorful spotlight. 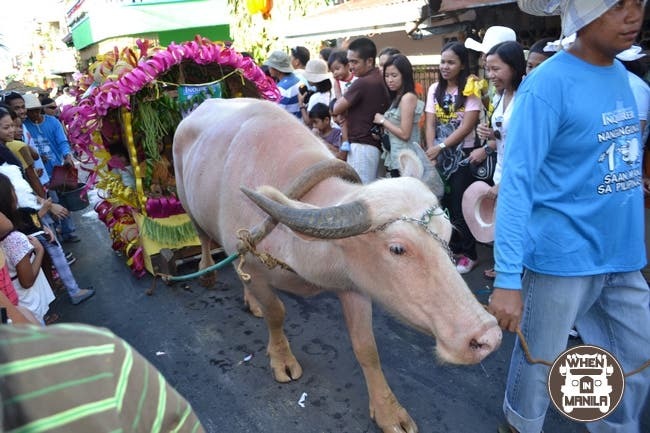 The Carabao is actually one of the main symbols that represents the Philippines. You can say that the carabaoes are the farmer’s best friend since they help a lot in the farming chores. Some of the Carabaos were really dressed up and unique like the white carabao and the other one who had horns like the virgo. 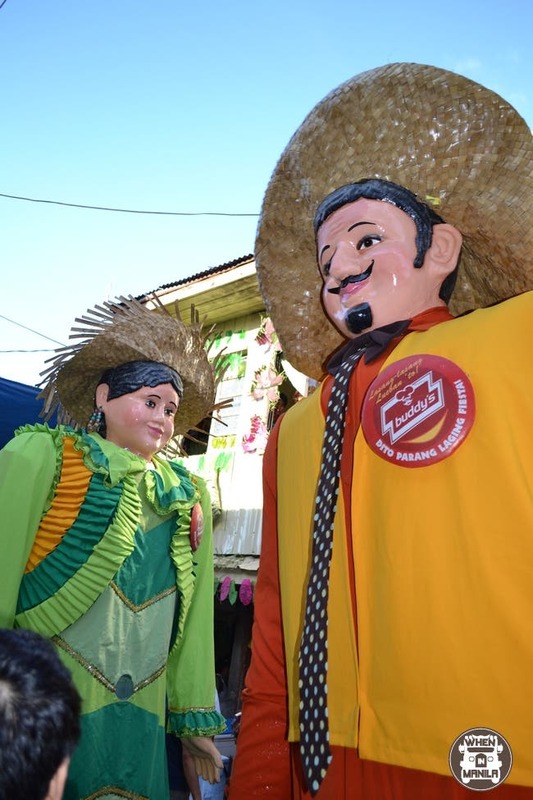 Last in the line for the parades were the Higantes (giants)! There were only 5 of them but they were definitely big enough to bring BIG joy and GIANT entertainment into the crowd. 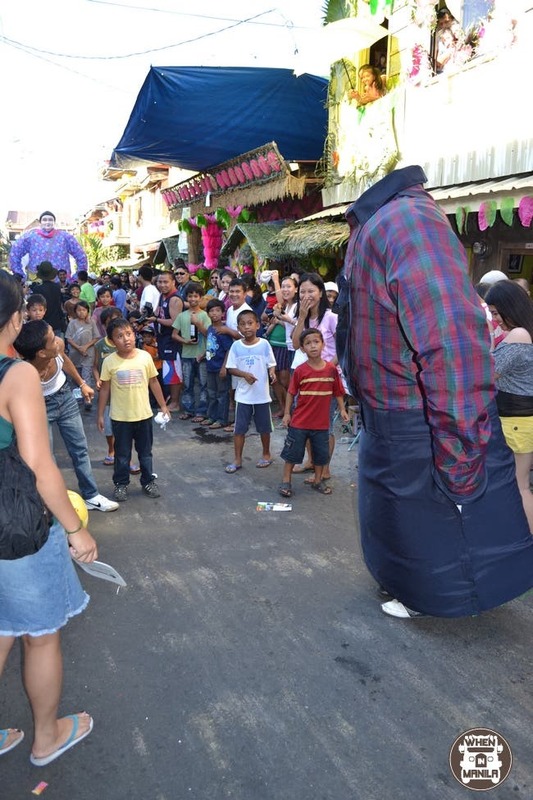 It was so much fun that one of the of the Higantes’ head fell off… maybe from of too much dancing… or from problems with Mrs. Higante… hehe. 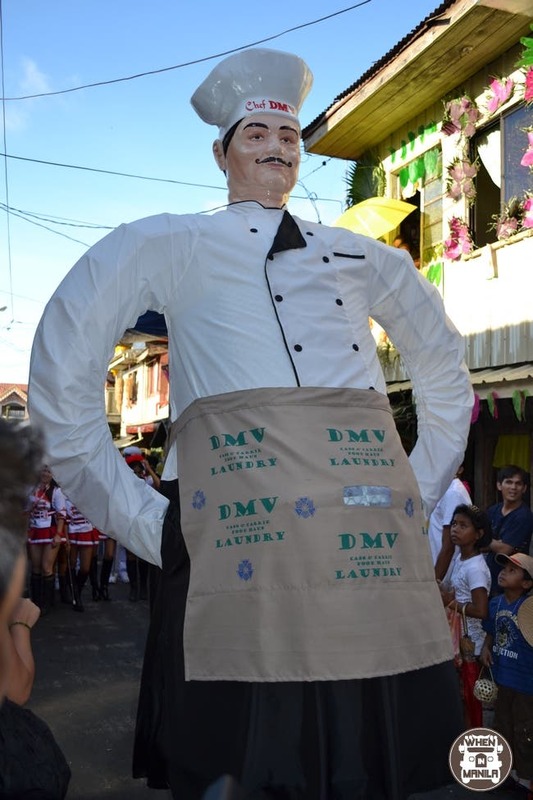 Though the Pahiyas Parade ended, our adventure still continued. After the long walk and watching the parade, we definitely felt hungry again. 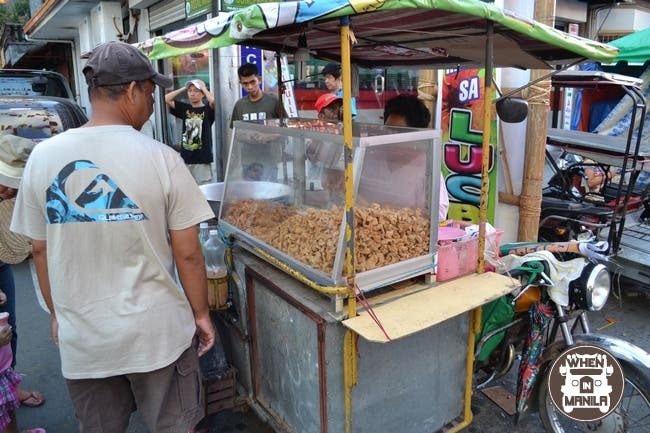 There were lots of food stalls along the streets where you can buy cheap snacks. There was shawarma, grilled sweet corns, chicharon, palamig, ihaw-ihaw stands with isaw (chicken intestines), dugo (chicken blood), adidas (chicken feet) and more local favorites. After the tease earlier, I was finally able to find some “Pansit Habhab” to taste! It was placed on a piece of banana leaf without any spoon or fork. You have to pretty much eat the noodles with just the banana leaf and eat these noodles like a burger in a burger wrapper. I was wondering why they called it “Pancit Habhab” and my cousin told me that it’s because when you eat it, you make a sound like “hab hab hab hab hab hab.” I didn’t know whether to believe him or not so I just laughed. It tasted delicious and was a little bit creamy. We got some Buko Juice (Coconut Juice) which completely complemented the meal. After eating “Pansit Habhab“, we passed 2 Longganisa (Filipino Sausage) stalls full of people buying their yummy dishes. I wanted to try it but the lines were waaaaay too long! Buddy’s is one of the most famous restaurants in Lucban and it seems that you really haven’t “been to Lucban” if you haven’t tasted their dishes. With that said, we definitely had to try their food. It was a bit past the normal lunch hours so the lines weren’t as long as they normally are, but we still had to wait a bit. The food here at Buddy’s was the best! It was really affordable too. Buddy’s had a great ambiance. It was time to go home but, as Filipino tradition dictates, we had to buy some “pasalubong” first. 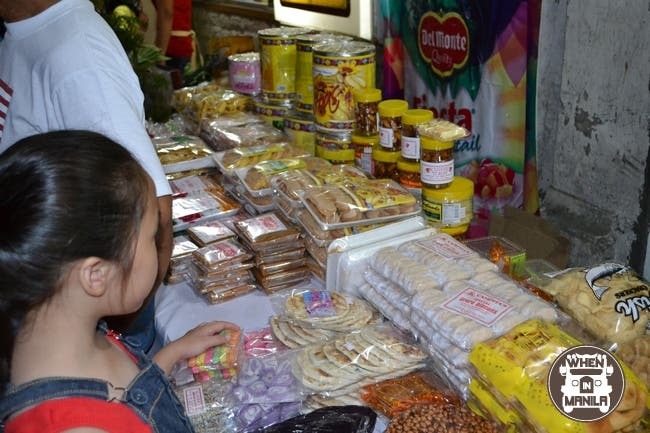 A “pasalubong” is actually a gift that you bring for loved ones. You usually get these “pasalubongs” when you go to places far outside of your hometown. It’s a tradition to sort of share your experiences and to let your loved ones know you were thinking of them while you were away. Not far away from Buddy’s Restaurant in Lucban, you’ll find Pavino’s Bakery where people flock to buy their baked goods, perfect for “pasalubongs“. Who can blame them, their pastries were actually awesome. Tiyanggians (bargain shopping stalls / bazaars) were also everywhere around this Pahiyas Festival and they each sold all sorts of unique and different things like keychains, tshirts, toys, hats and even Henna Tattoos. I ended up buying a mug with a Pahiyas Festival printed on it and a coin bank made of a coconut shell. 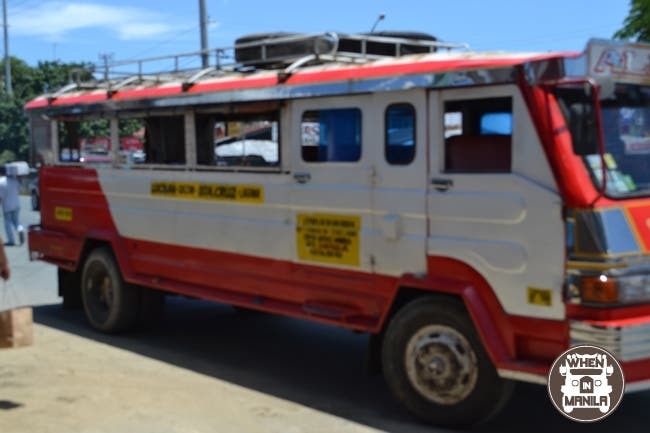 If you’re coming to the Pahiyas Festival on a private vehicle, be sure to leave early because if you arrive here anytime after noon, you’ll have a very hard time finding a parking spot. Bring a face towel or a handkerchief, change of clothes and a cap because it can really get hot roaming around the streets. Bring Tupperware, your own plastic bag or anything where you can put the goodies, food and gifts “pasalubongs” that you will buy because there is a “NO PLASTIC” law in here. So everything you will take out will be placed in a paper bag. And if you have sweaty hands like me, good luck! Be careful of your things. There’s a lot of people in the festival so always be alert. Bring your camera! It’s a must! It was a great adventure for me and my cousin because it was our first time to attend this kind of festival and I hope we can visit Lucban again for their Pahiyas Festival next year. The trip might be long and quite exhausting but everything was worth our time. Exploring and witnessing this kind of Filipino tradition was extraordinary. 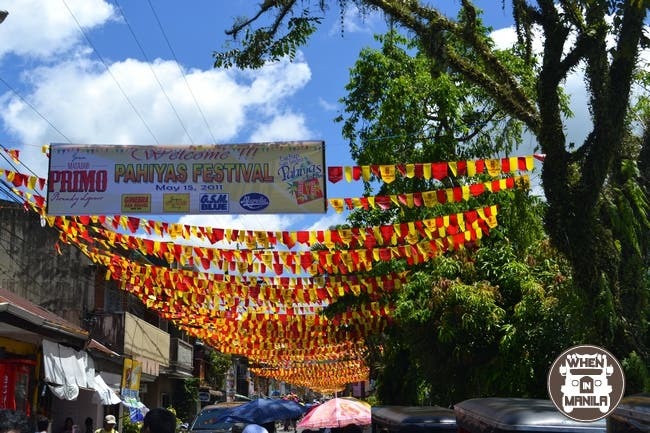 So When in Manila, remember to mark your calendars, have a day off and go to Lucban, Quezon to witness the Pahiyas Festival. FUN FACT: It will take another 5 years before it will be held again on a weekend. Rikki John de Castro is a SEO freelancer who enjoys the wonderful privilege of working at home. He's an amateur photographer who likes to take his shots with whatever gadget is at hand. A medium-sized guy who makes eating delicious foods his hobby. A traveler wannabee who wishes to explore the entire Philippines and the whole world as well. A gadget maniac who wants to buy every new gadget out there. Rikki is a seasonal blogger who creates new blogs and then later forgets about it - but this time its for real so please visit his blog. Figaro Coffee Company launches Spoon Meals!